Have you ever considered becoming an auctioneer but didn't think you had enough time or money? Has the fear of spending thousands of dollars on food, lodging, and airfaire kept you from pursuing your auctioneering dreams? Guess what, now you can learn the art of auctioneering from the comfort of your own home! Introducing "Bid Calling Basics" - the most comprehensive online bid calling course available today. Our easy to follow system provides you with all the tools you need to become a successful auctioneer. 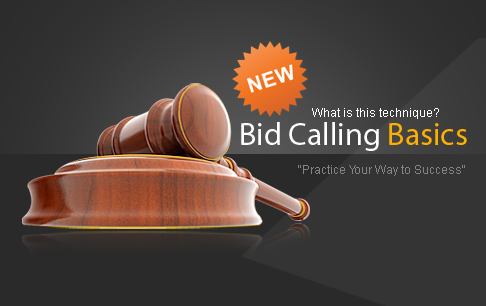 Invest in your future and find out what Bid Calling Basics can do for you. So what is Bid Calling Basics exactly? It is an online web-based course designed with both the new and experienced auctioneer in mind. Whether you're just getting started or are a seasoned veteran Bid Calling Basics has something for everyone. No more wondering what to practice or how to advance your skills. This course is laid out in a step by step process that will allow you to learn at your own pace and convenience. Your purchase of $99 dollars is a one time fee and includes a lifetime membership and 24 hour a day unlimited access. Bid Calling Basics is designed to teach you by using audio and visual tools simultaneously. The course contains several hours of bid calling drills. Other topics include voice care, intros and wrap-ups, and yep recordings. BCB also includes over 50 tongue twister drills. Plus it's packed with a list of over 150 possible filler words and salesmanship phrases. If that's not enough for you, I have also added several surprise bonus sections. I also share some of my most valuable tips that I've learned after fifteen years in the business. This kind of information alone is worth the price of admission! If you're looking to develop a long term sustainable chant, then this course is for you. Make no mistake about it, building a quality chant takes time and effort. Only through "Repetition and Consistency" will you have the opportunity to reach your full potential. This course will provide you the solid foundation necessary to achieve future success. So what are you waiting for? Start having fun today and perfect a skill that very few people possess. You have nothing to lose and everthing to gain! Remember, I'm here to help you become the best Auctioneer you can be. We all have to start somewhere and I was in your exact same position only a few years ago. Check out the "Course Samples" above on this website for a basic idea of the course format. ** 2002 Graduate of World Wide College of Auctioneering Mason City, Iowa. ** Worked as a full time professional auctioneer for over 15 years. ** Global Bid Calling Instructor. ** 2004 Oregon Grand Champion Auctioneer. ** Oregon Licensed Real Estate Broker. ** Successful Entrepreneur and Business Owner.